Over the years we've come across many hydrophobic coating technologies aimed at electronics, but sadly, none of those were made directly available to consumers. The closest one was Nokia's nanocoating demonstration we saw last October, though the company recently said to us that it's still "currently a research project," and it never mentioned plans to offer a service to treat existing devices. 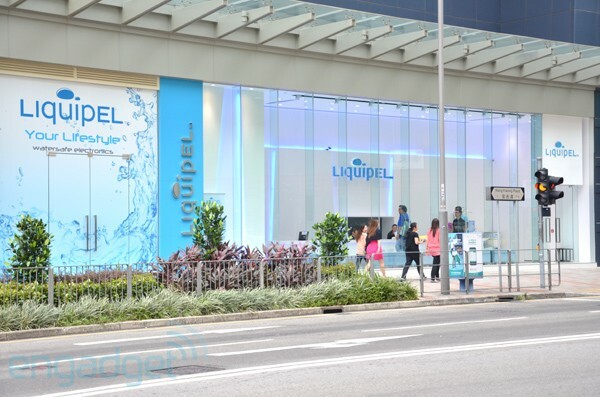 On the other hand, Californian startup Liquipel recently opened its first Hong Kong retail store, making it the second Liquipel service center globally after the one located at the Santa Ana headquarters. Folks in the area can simply call up to make an appointment, and then head over with their phones or tablets to get the nanocoating treatment. So how does this funky technology work? How does it cover both the inside and the outside of gadgets? And is Liquipel's offering any better than its rivals? Read on to find out. Before we get too carried away, let's set the record straight first: what Liquipel's offering here is protection against short-circuiting and corrosion, but liquids will still be able to enter treated devices. Also, while this process works on practically any surface, prolonged immersion may eventually affect moisture indicators and therefore void warranty (even though the chances of requiring a repair due to liquid damage is slim, anyway), so users are advised to remove dropped devices from liquids immediately, rather than intentionally dunking them or leaving them in liquids. Having said that, Liquipel is happy for people to use treated devices in the rain, shower, bath, snow or even sauna -- provided that they stick to the aforementioned advice, of course. Simply put: Liquipel's main purpose is to increase the chance of survival, rather than to convert all gadgets into swimming gear. There are a couple more caveats. For those who have naughty hands or a passion to show off, Liquipel asks that ice water should be avoided -- not because of any impact on the coating, but rather because it may permanently damage the LCD. Also, if a device does somehow end up fully submerged in a liquid, the users should still take the usual precautions: power down, take out the battery if possible, wipe the sockets and let the device dry for at least 24 hours (ideally in conjunction with absorbent materials). Liquipel told us that in some cases, the device may have liquid sensors that automatically shut itself down, which has apparently freaked out some users; but following the above procedure should restore the device with no damage or after-effect. Obviously, this would be a rather different story for the untreated devices, especially if the liquid is of acidic nature. In between Liquipel's launch of its first Hong Kong store (in Kowloon Bay) last month and its first Kuala Lumpur store this week, we sat down with the company's co-founder and co-president Kevin Bacon (no, not that Kevin Bacon) to hear about the fascinating treatment process. First of all, the devices are placed on racks inside a large "Liquibot," then a near-vacuum environment is created inside the chamber, followed by the injection of a liquid repellent formulation which becomes a gas under the low pressure. By using strategically placed valves, the machine's able to manipulate the flow of the gas, which is why Liquipel can treat fully assembled devices (though Liquipel's Hong Kong store is also happy to treat devices pre-disassembled by customers, provided that they are aware of warranty issues). After letting the gas flow around for a while, the Liquibot then generates a plasma in order to polymerize and bind the gas molecules onto the devices, both externally and internally. The resulting coating -- which is about 1,000 times thinner than a human hair -- creates a microscopic air gap between the target material and liquids, thus producing the super hydrophobic property. To ensure consistency, Liquipel places a piece of tissue in each run as a control, and afterwards it is tested with a corrosive oil, and obviously, all is good if the tissue stays in one piece. The process takes about 30 to 45 minutes plus extra for cleaning, so customers can usually pick up their devices within an hour or two. Level I, Spill & Splatter Protection: This provides protection from brief, light, accidental liquid contact. By light we mean like accidental liquid spills and splatters. Devices include sixth-gen iPod nano, EVO 4G LTE and Atrix. Level II, Slosh & Slip Protection: This provides protection from brief, moderate, accidental liquid contact. By moderate we mean things like accidental liquid spills, a surprise poolside slosh of water or even a quick, accidental slip into the sink or toilet. Devices include thrid-gen iPad, sixth-gen iPod shuffle, Galaxy S III, myTouch 4G and Droid X2. Level III, Drench & Dunk Protection: This provides protection from brief, heavy, accidental liquid contact. By heavy we mean things like a sudden torrential downpour of even a quick surprise push into a pool. Devices include iPhone 4S, One XL / One X AT&T, Galaxy Nexus and RAZR / RAZR MAXX. Keen geeks can still take unapproved devices to the Liquipel store, where the technicians will determine their feasibility on a case-by-case basis; but those that are accepted usually only get a Level I guarantee. 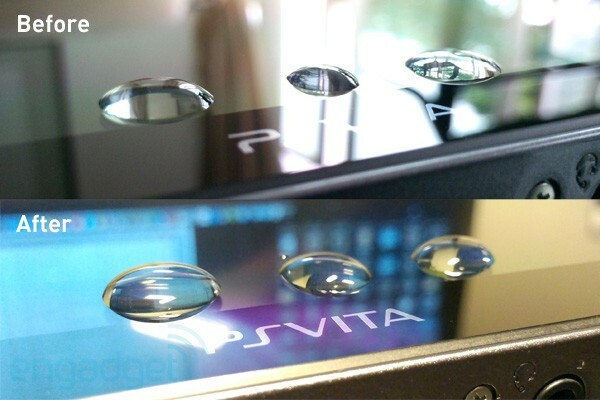 Of course, as mentioned earlier, you can always have your devices pre-disassembled to get a better effect (this author did just that with his PS Vita), but Liquipel still won't be able to provide a higher rating until it's done its own certification tests -- it mostly depends on how long it takes for all the trapped liquid to disappear. Regardless of the rating, Liquipel does say on its website that it "assumes no responsibility for water damaged devices," but it does offer a seemingly generous after-sale service in the Asian stores. For one, if you're given a replacement device due to hardware failure on the original one, then the replacement is eligible for a free Liquipel treatment within 30 days after the original date of purchase. Also, within 90 days after the first treatment, any device that's been repaired by the manufacturer can get a second treatment for free. Obviously, you'll need to show the relevant documents for both cases. We pointed out to Kevin that HzO, a major rival who we met back at CES 2012 (and, ironically, also backed by Hong Kong's richest man Li Ka-shing), seems to feature similar method and properties with its "WaterBlock" technology: vacuum environment again, and fully assembled devices are doable as well. Kevin then pointed out that not only does his company have its own IPs, but also HzO actually uses a different material dubbed paralyene, the resulting coating of which is essentially just wrapping plastic around devices as it's non-breathable; and as this requires an extensive amount of masking, the process becomes very cumbersome for manufacturing partners. Additionally, Kevin said that paralyene treatment also has an impact on the target objects' physical properties. He used tissue as an example: if treated by HzO it would become stiff and hard, whereas Liquipel would retain its softness and flexibility. In fact, Liquipel gives out a piece of super hydrophobic tissue to each customer as a show-off gift, and it has already mesmerized many of this author's friends. After the fireside chat at the Hong Kong store, we were given access to the room that housed the large Liquibot machine. Sadly, no photos were allowed, but the particular model installed there was about the size of three or four standard home fridges, and it has the capacity to process up to 200 mobile phones in each one-hour cycle. This is actually just one of the three models offered by Liquipel, with the larger one capable of handling almost five times as many devices a go. But for a place like Hong Kong where space is expensive, we can only speculate that the company is going to work on a much smaller model to cater more shops. As for the other Liquibots, Liquipel does also offer B2B services, but Kevin preferred not to give out names or examples. So, does it work well? We used a handful of devices as guinea pigs: ASUS PadFone, LG Optimus LTE II, Samsung Galaxy Tab 7.7 and PS Vita. As mentioned earlier, it really doesn't look or feel like they have been given the nanocoating. With the exception of the tablet, none of these were actually on the approved list so Liquipel could only guarantee a Level I protection. We haven't yet used the Vita in the shower (who would, anyway? ), but we've definitely done so many times with the rest -- mainly to listen to music, watch videos or continue socializing on the various platforms -- and they all came out just fine. As you can see in our video earlier, we've even let our Optimus LTE II stay in shallow water briefly without damaging it. For just HK$449 (in the US it starts from US$59) for a phone or HK$559 (US$89 in the US) for a tablet, this is a pretty good investment for adding both protection and versatility to gadgets. And of course, since each treated device is given a little certificate card, owners can use it to bump up the resell value. Potential customers in Hong Kong and Kuala Lumpur can call up the shops to book an appointment (Indonesia and China will also have Liquipel stores soon), whereas US customers can simply make an order on the official website. Oh, and stay tuned, as the company's already looking into adding some laptops to the list.